Lee Bassett was my favorite docent to partner with at the Ruth Barn. Here he is pictured with one of the pitchforks he loved to showcase. Every community has those unique individuals who seem to pop up everywhere that help is needed; who simply have a heart for public service. Long Grove lost one of these treasures yesterday, with the passing of Lee Bassett. Lee was a compact dynamo, tireless in his dedication to our Village and generous with his time and passion. Lee was responsible for calling me up and asking me to serve on the Historical Society board way back in 1999. He was the kind of volunteer we all look up to as a role model of servant leadership. One of his biggest contributions to Long Grove was serving as President of the Long Grove Park District. 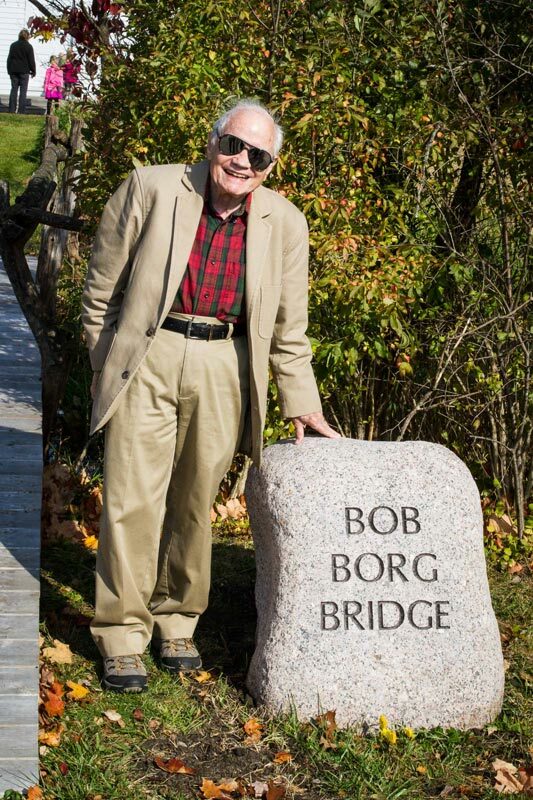 Lee donated countless hours as a local environmentalist and caretaker of his own heavily wooded property and various public open spaces throughout the village. I loved seeing Lee and his good friend Bob Borg out in my neighborhood every May, sporting backpacks and sprayers in their never-ending battle against invasive teasel. 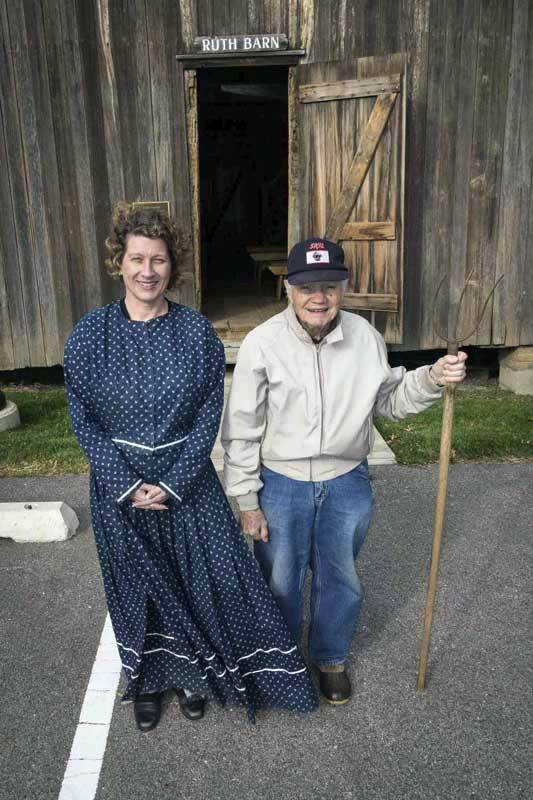 Lee also served for many years as our Long Grove Historical Society Vice-President, and as a docent for thousands of children who have participated in our Archer School and Ruth Barn field trip programs. Some of Lee’s favorite items to show and tell were the pitchforks in our collection, and how they each had a varied and specific use. His infectious enthusiasm would get the kids wound up, then I had the challenge of making them sit still and practice their penmanship in the schoolhouse! Lee loved to entertain as well as educate, and was a fellow castmate in our “Long Grove Lurid Legends” Halloween show a decade ago. He got such a kick out of playing a member of the real life “Newton Gang,” who robbed a train right here in Lake County. Both kids and adults delighted in his presence. Lee will be remembered at a “Casual Gathering of the Friends of Lee” next Wednesday, July 25th, from 1:00-4:00 in the afternoon at Reed-Turner Woodland Nature Center. He will certainly be missed by all those that he has touched during his years here in Long Grove. He was a friend and an inspiration. Patti Ecker and Mike Dvorak brought “Songs of the Prairie” to our farmhouse back porch for the July 6th performance. Illinois was first designated a state in 1818, and a wide variety of events have been planned to mark this special 200th anniversary year. Here in Long Grove, the Historical Society is hosting a series of “First Fridays at the Farmhouse” performances to honor our state bicentennial as well as celebrate our local history. In June we were treated to “Spoon River Anthology,” a classic portrait of life and death in a turn-of-the-century Illinois town. Last week, singer and multi-instrumentalist Patti Ecker was joined by Long Grove musicians Reed Olsen and Mike Dvorak to entertain us on the farmhouse back porch with folk songs, sing-a-longs, traditional and popular selections that reflected chapters in our Illinois history. Did I mention that all this great, outdoor, family-friendly entertainment is free? Please plan to join in the fun at the remaining two performances on the First Fridays of August and September starting at 6:00 pm. Friday August 3rd will feature “Birth of a State.” Come and find out what was happening in culture, politics, music, theatre, and everyday life during Illinois’ first summer of statehood. On Friday, September 7th, we will hear the tales of local Civil War veteran Chris Sauer told through stories, music and song in a show entitled, “Company’s Comin’.” Mark your calendar now and enjoy an evening in our historic downtown among Long Grove neighbors and history enthusiasts. You might learn a thing or two, also!